For me, summertime and Portobello mushrooms go together wonderfully. They are light and airy, yet still provide a robust, meaty flavor that I love. They are also very versatile. From chopped, sautéed, and used in pasta dishes, to grilled and used as a burger alternative, Portobello mushrooms can be jazzed up and changed around to your liking. This recipe is for my Portobello Mushroom Cap Pizzas. Unfortunately, I live in an apartment with little room for an actual grille outside so I used my George Forman, but an outdoor gas or coal grille would have been my first choice for preparing the mushrooms! Once your mushrooms have been cleaned, dried, and de-stemmed, place them on the grille for about 3-4 minutes (this was on my George Foreman where they were pressed, if on a normal grille, do about 2-3 minutes on each side; you may want to brush with a little olive oil as well to avoid sticking on a normal grille). Slice your Roma tomatoes to make about 1/2-1 cm thick rounds. You will need 6 slices total, so if your tomato is extra small you may need to use a second. A full-sized vine ripe or steak tomato may be used instead, just use one slice as it should take up about the same size as 3 Roma rounds. Once your mushrooms have been grilled, place them on a baking dish, lined with foil and sprayed with a little cooking spray. The stem side of the mushroom should be facing up. Spoon about 2 Tbsp. of sauce onto each mushroom cap. One top of the sauce, place a few spinach leaves to cover the sauce. Press them down gently so that they flatten out. Place 3 tomato slices on top of the spinach. Season with a pinch of dried thyme, dried basil, a little black pepper, and garlic powder. Once each mushroom has been seasoned, top each one with out 1 Tbsp. of shredded, fine parmesan cheese. If you would like your mushrooms a bit cheesier, go ahead an add a little more cheese! The parmesan cheese adds a salty taste, so there is no need to add extra salt. Place the mushrooms into the oven for 10-15 minutes or until the cheese is fully melted and starting to get a little golden brown on the edges. Enjoy your mushrooms with a side salad or a little pasta of your choice! Enjoy! 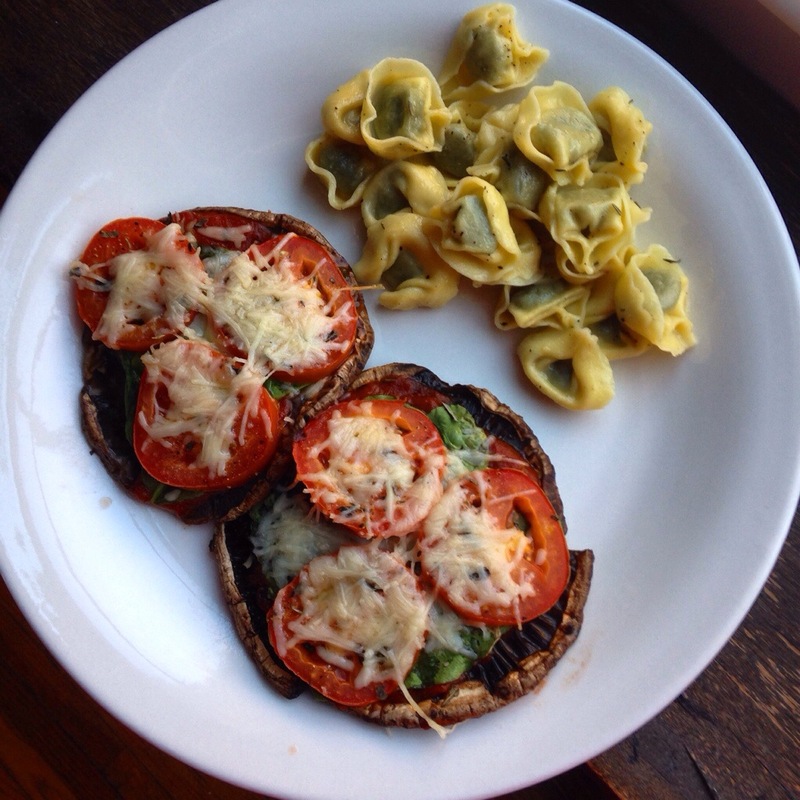 This entry was posted in Entrees, Recipes and tagged cooking, dinner, healthy, herbs, Italian, light, pizza, portobello mushrooms, vegetables, veggies. Bookmark the permalink.